This character is from the tabletop super-hero role-playing game Champions. He’s a clear equivalent of the Joker, with a large dash of the Jester and (especially) the Toyman thrown in. Though he’s derivative, a good chunk of the murderous toys he uses are quite eye-catching. Known Relatives: Domineering Mother & Sisters, Father (all deceased). Base Of Operations: Originally Millennium City, now mobile. He’s best known for his attack toys. These are tiny robots in wickedly whimsical forms – toy planes armed with real bombs, teddy bears wielding butcher knives, robots with little built-in guns, and so on. In game terms, these function as an Indirect attack, since they can approach the target from just about any angle. They are fairly easily breakable. In DC Heroes RPG terms a mere 2 RAP’s is enough to destroy the toy, causing the Black Harlequin much anguish. Many of his attacks have a limited range. He generally has to be within 2-5’ (depending on the gadget) to hit a target with them. Since he’s adverse to suffering pain, he usually uses evasive fighting techniques on such occasions. Rinaldo Maretti spent a good deal of his teen years in his family’s basement. Either involuntarily, or as a means of escape. Maretti was accused of perverted, impure, thoughts towards his sisters by his abusive mother. He was told that since he couldn’t behave around other people, he wouldn’t be allowed to be around other people. That was when she slapped him. Once the slapping ended, she dragged him over to the basement door, shoved him down the stairs, and slammed the door shut. A bit of groping found the light-switch and eventually the weak bulb hanging over his father’s old workbench flickered on. A thick coating of dust lay over everything, no-one had used the bench of the tools since Poppa died a few years ago. Some half-completed toys still sat there, crippled and forlorn. Wiping away his tears, Rinaldo pulled out a shaping knife and decided to make something. He still remembered some of what Poppa had taught him. If the girls didn’t want him around, …fine, he’d make his own world, full of people who did. Rinaldo, now age 16, was found living in the basement, with only a large collection of self-made models and puppets to keep himself company. He was remanded to the care of the state after his mother and sisters were found brutally murdered in their home. They had bled to death as their bodies displayed numerous tiny, yet brutal, slash and stab wounds. When asked why he was living in the basement, Rinaldo responded “Because Momma told me to.” Inquiries were soon made regarding a foster home. The foster home didn’t quite work out. The Reynolds were nice people, he supposed, but so serious! They never seemed to have any fun, and they tried to take away his toys. He didn’t stay there for very long. After all, the “Official People” wouldn’t be likely to let let him go if they found him around a second set of bodies. There were so many other games to play, and he didn’t want anyone to stop him. The world was such a place! The toys performed perfectly once again, albeit having killed four people in the process, as the jewelry store net him a haul worth over three million dollars. The police weren’t a problem. Thickwitted and slow, they never could manage to stop one of his Escapades before he was done. Those costumed crimefighters though, they were another thing altogether. They looked so pretty, almost like big wind-up dolls, but they were no fun at all. The first time he met one, he barely got away. None of his little toys would hurt the big, annoying fellow. He would have to learn to be more careful, as they just wanted to lock him up, like Momma did, and he didn’t want any of that. There were way too many escapades left to have! The Black Harlequin is a tall, almost scarecrow-thin, young man. 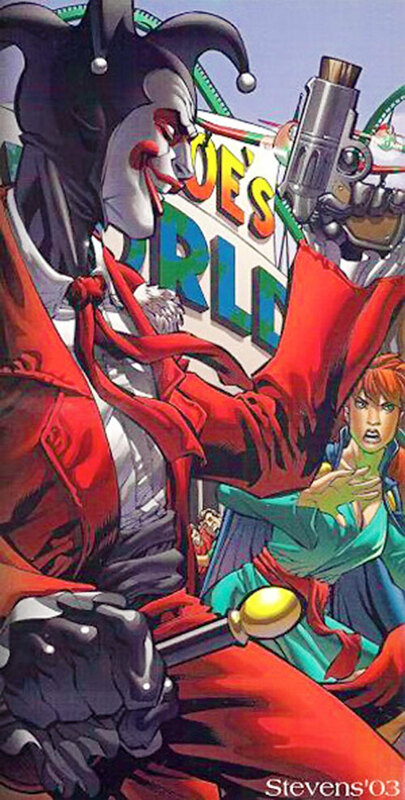 He wears either a jester’s motley in black, white,&dark red, or a tuxedo-like outfit (complete with jester’s cap on top of his head) in the same colors. His face is concealed either by greasepaint in a style that gives him a rather devilish grin, or an opera mask painted in much the same pattern. 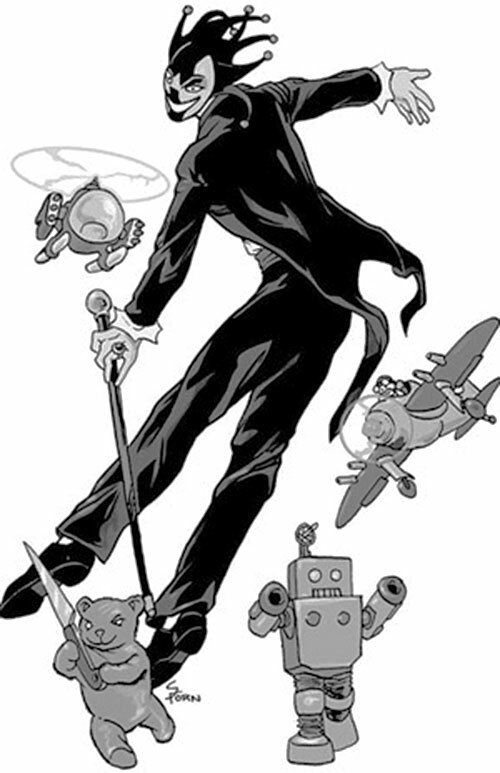 He carries his Jester’s Cane, and his pockets are stuffed full of his gimmicked weapons and deadly toys. Utterly sociopathic, Rinaldo expresses his antisocial tendencies through his twisted, macabre sense of humor. To him a joke isn’t really a Joke unless the punchline hurts someone, and an escapade (as he calls his crimes) isn’t really an Escapade unless it involves death and destruction. Unpredictable and manic, he may caper and jig one moment, singing a merry tune all the while, and the next casually slash a few throats because his “accompanists” weren’t singing along loudly enough. He particularly hates to see people sad or upset. Everyone should be jolly around a harlequin! Melancholy expressions tend to attract his attention, which is never pleasant. Often the hapless victim ends up dead, a bloody smile carved into his cheeks by one of Black Harlequin’s knives. Black Harlequin is basically a dark mix of DC’s Toyman and the Joker (as if those two weren’t creepy enough on their own). He could be a stalker fan-boy that falls for Harley Quinn (even their colors are similar) in much the same way Harley fell in love with the Joker. Odds are, he wouldn’t last long, as Harley, though flattered, might thrash him, and either Joker or Toyman would likely try to kill him, not wanting the competition (doubly so in Joker’s case). He might last a little longer if introduced in a smaller city setting, though his similarities to established DC characters would still likely gather comments and comparisons eventually. Barring that, either villain might actually adopt him as a protégé. Odds are, however, that the results will still end up being rather similar. Double Jointed, Scholars (Toys & Games, Jokes, Riddles & Puzzles). Criminal Underworld (Low), Street (Low). SIA to toys & toy motif crimes, Catastrophic Psychological Instability (Sadistic Sense of Humor), Secret ID. Attack Toys (x6) [BODY 02, AV 05, EV (Indirect, Continuous(as Disintegration)): 01, Sharpness(with EV): 03]. Cherry Bomb [BODY 02, Bomb: 08, Ammo(Grenade Drawback): 08]. Confetti Popper [BODY 01, Flash (No multi-attack, inoperable vs Dispersal, Range is 0 APs, no Built-in AV): 12, Ammo(Grenade Drawback): 08]. Razor Jacks [BODY 01, Claws “Being” (Area Effect, Only vs those using ground movement): 03, Ammo: 02]. Not-So-Silly String [BODY 02, Snare (Range is 0 AP’s): 06, Ammo: 08]. Giggle Gas [BODY 02, Snare (OV/RV= Int/Mind, RAP’s still reduce Dex, No multi-attack, Range is 0 APs, can be defended with Sealed Systems & Iron Will, defender must escape with Int/Will): 08, Ammo: 08]. Jester’s Cane [BODY 09, EV 07, Sleep (No AV(use Dex), No multi-attack, Range is 0 APs, can be defended by Sealed Systems, Ammo: 06): 10]. Jester’s Motley (Costume) [/BOD/ 07]. Chattering Teeth [BODY 01, AV 03, Claws (Continuous(as Disintegration)): 01, Jumping: 00, Sharpness (With Claws): 04] – This novelty item will bite into a victim and keep chewing as long as it is able. Jackknife in the Box [BODY 04, AV 04, Claws: 04, Stretching: 00 Ammo: 01]- This fiendish jack-in-the-box stabs people with a wickedly sharp knife once it hits the proper chime. Raggedy Aneurysm [STR 04 (Only to grab & hold onto target) BODY 04, Vibe (No Range, Continuous (as Poison Touch)): 04]- This cuddly rag doll clamps onto a victim and generates sonic pulses that cause internal bleeding. Rickety Rocket jetpack [STR 02 BODY 02, R#02, Flight: 05, Fog: 05]- It belches smoke, makes funny noises, and looks like it might fall apart any second, but it works, and it’s enough for an escape when things get tight. Tears of a Clown [BODY 02, Disintegration: 05, Ammo (Grenade Drawback): 08]- People splashed with this caustic liquid have plenty to cry about themselves. AP levels are modelled more after what I feel is the spirit of the character than being based upon any necessarily specific numerical conversion. 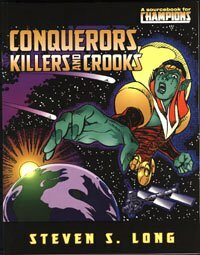 Source of Character: HERO Games’ Champions products, Conquerors, Killers & Crooks specifically. He’s also the focus of an adventure in Champions Battlegrounds. Helper(s): Kal El Vigilante, Eric Langendorff. Most all descriptive text is taken directly from the book (C.K.C) mentioned above.